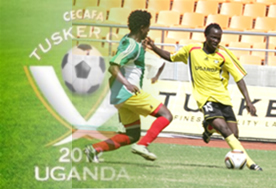 Uganda Cranes became the first nation to qualify for the 2012 Cecafa Senior Challenge Cup after a 1-0 triumph over Ethiopia . The defending champions and hosts of the tournament scored early through Brian Umony in the ninth minute. A heavy afternoon downpour made for a wet surface and difficult conditions but Uganda played with a lot of purpose to pin the Ethiopians back for long spells of the match. Fikru Teferra Lemessa, the only player who featured prominently for the senior team that qualified for the 2012 Africa Cup of Nations, gave a captain's performance for Ethiopia but was kept in check well by the Cranes.